There are several parking areas located around Old Town including the lot on 19th Street & Old Town Road adjacent to the Albuquerque Museum; the average rate is $5 / day. You may also park in the outdoor garage located off Mountain Road and San Felipe near Seasons Restaurant. Complimentary on-street parking is available around the perimeter of Tiguex Park (between Mountain Road, 19th Street, and Old Town Road – near the Albuquerque Museum) and two-hour complimentary parking is available throughout Old Town. Closed for the Winter Season (Dec-Feb). Custom tours still available. 2019 tour schedule has been updated. We pick-up and deliver bicycles within the Albuquerque Area, most locations are free! BUT WAIT! What if you are outside of Albuquerque? We are happy to assist with your rental needs as well (whew)! Please call if delivery is needed outside of Albuquerque. Tours depart directly in the Santa Fe Historic Plaza, at the luxurious La Fonda on the Plaza Hotel. 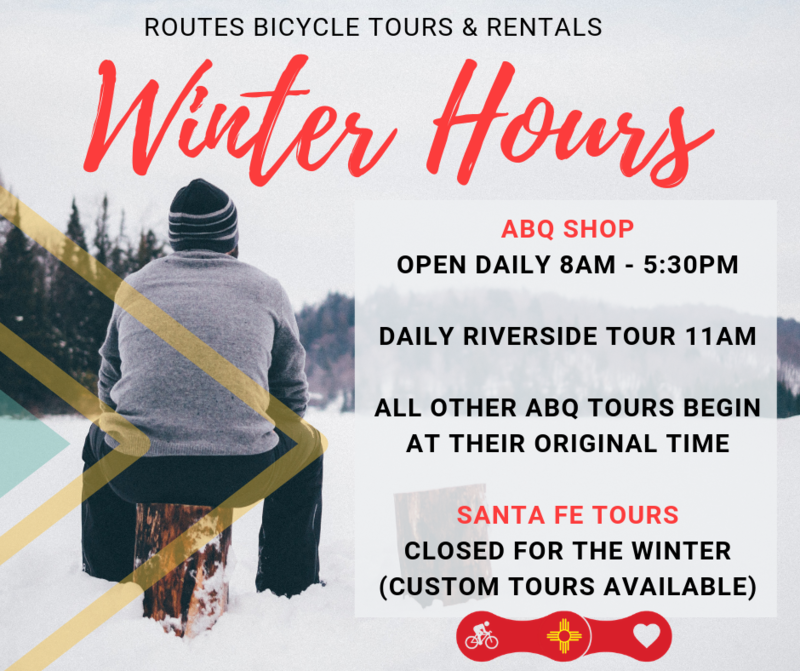 Routes Santa Fe is CLOSED for the Winter Season (December – February). 2019 Season begins in March. Routes is closed on the following holidays. Multi-day rentals are still available during these holidays.